FREE 32GB SDHC Class 10 Memory Card! 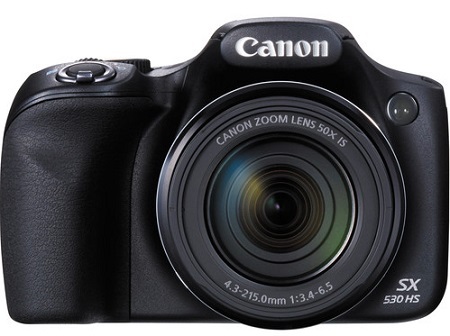 Combining an expansive zoom lens, high-resolution imaging sensor, and extensive sharing capabilities, the PowerShot SX530 HS is a versatile and convenient point-and-shoot digital camera from Canon. A 16MP High-Sensitivity CMOS sensor and DIGIC 4+ image processor pair to form the HS SYSTEM, to achieve notable image clarity, especially in dim and difficult lighting conditions, sensitivity to ISO 3200, and a high speed burst rate of 10 fps. Complementing working in a wide variety of situations, a 50x zoom lens provides a 24-1200mm equivalent focal length range, which is further benefitted by Intelligent IS image stabilization to ensure sharp and clear imaging. 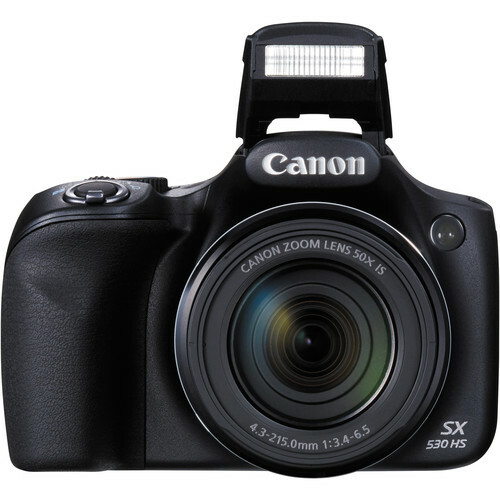 Beyond shooting capabilities, the SX530 HS is also wirelessly adept, with the ability to transfer imagery directly to mobile devices via Wi-Fi, connect using NFC, and remotely control the camera from linked smartphones or tablets. Full HD 1080/30p video recording is also supported in addition to still shooting, and easily accessible via a dedicated movie button. Benefitting working with distant moving subjects, Zoom Framing Assist helps to maintain focus and composition when working at longer focal lengths. Hybrid Auto, Smart AUTO, and Creative Shot modes are all available to refine the look of imagery, and a 3.0" 461k-dot LCD screen is incorporated into the ergonomic design for live view monitoring and image playback. Additionally, the SX530 HS is compatible with the optional Connect Station CS100 for automated wireless backing-up, storing, and sharing imagery. 16MP CMOS Sensor and DIGIC 4+ Image ProcessorThe 16MP High-Sensitivity CMOS sensor produces high-resolution imagery that, when paired with the DIGIC 4+ image processor, exhibits notable clarity and sensitivity to ISO 3200, as well as a top continuous shooting rate of 10 fps. The sensor and processor work together to create Canon's HS SYSTEM, which is able to produce clear, rich imagery in dimly-lit situations with minimal noise and vivid detail. Beyond still image recording, the SX530 is also capable of recording full HD 1080p video at 30 fps, which is easily accessible via a dedicated movie button. Â Â 50x Optical Zoom LensCovering wide-angle to super telephoto perspectives, the 50x optical zoom lens provides a 24-1200mm equivalent focal length range to suite working in nearly any situation. Intelligent IS image stabilization benefits this extensive reach, as well as when working in difficult lighting conditions, by compensating for camera shake for sharper, clearer imagery. Eight distinct stabilization modes are available to best suit different types of shooting: Stills: Normal IS corrects for a wide range of common camera movements. Panning IS detects deliberate panning movements and does not compensate for lateral movements to permit desired camera movements. Macro (Hybrid) IS corrects for shift-type camera shake that commonly occurs when working with close-up subject matter. Tripod is a dedicated setting that automatically deactivates IS when the use of a tripod is detected since camera-based stabilization is not needed. Video: Dynamic IS is well-suited to recording at wide-angle focal lengths and reduces unwanted shaking that typically occurs when walking while recording. Powered IS compensates for hand movements that become more visually discernable when working at the telephoto end of the zoom range. Macro (Hybrid) IS minimizes the appearance of shake when walking as well as compensates for shift-type shake that occurs when working with close-up subject matter. Active Tripod IS minimizes the slight amount of shake that can happen when recording video while using a tripod. Built-In Wi-Fi with NFC and CS100 CompatibilityBuilt-in Wi-Fi connectivity enables seamless and instant transferring of photos and videos to mobile devices, home computers, and to select social networking sites. Linking Android devices to the camera is aided through the incorporation of NFC (Near Field Communication), which facilitates connection simply by tapping the two devices together. 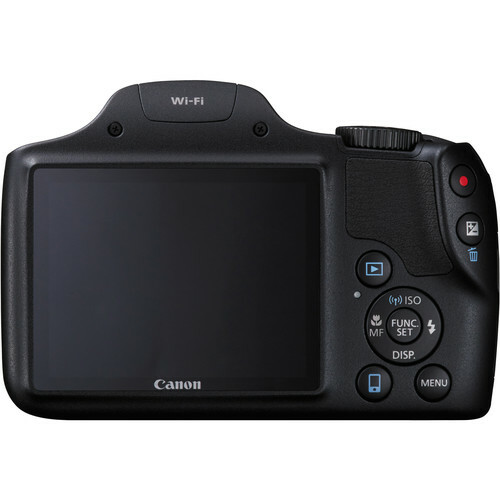 Additionally, linked mobile devices can also be used to remotely control and release the camera's shutter and display a live view image on the linked device's screen when using the Canon CameraWindow app. Wi-Fi and NFC connectivity further provide compatibility with the optional Connect Station CS100 for automated wireless transferring and sharing of files. Â Â Other Camera Features A 3.0" 461k-dot LCD monitor is available for live view monitoring, image playback, and menu navigation. High Speed AF utilizes updated algorithms and technologies to benefit subject tracking and overall focusing accuracy and speed. Zoom Framing Assist automatically zooms in or out to keep a subject within the frame and in focus when using longer telephoto focal lengths. Creative Shot modes help to transform your original imagery into creative and unique works using a system of 46 in-camera filters, which are grouped within Retro, Monochrome, Special, and Natural categories Once the original image has been taken, the camera will automatically produce five additional variations using this series of filters. Hybrid Auto will record short video clips prior to recording a still image, and then automatically compile them into one file to produce a highlight reel of a shooting session. Smart AUTO intelligently selects the proper camera settings based on recognized shooting situations.